sap, Yak bone and Silver-plated base metals. Each piece has a unique and exquisite astrological animal carving on the back. 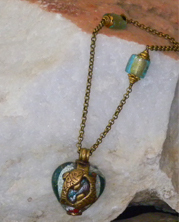 Artisan heart-shaped Venetian glass pendant adorned with interlocking fish on a long chain. 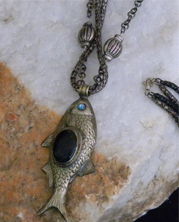 Elegant, large silver-plated fish with black stone on double chain. 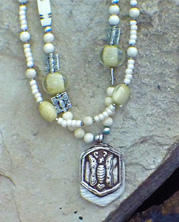 Double-sided good luck talisman in green lucite on chain with accent beads. 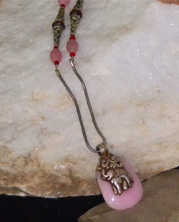 Pink quartz Tibetan pendant with elephant carved in Yak bone has a tribal feel. Elegant green stone pendant with silver-plated cap and green beads. Silver-plated butterfly and leaf cap Yak bone pendant, with delicate glass beads. 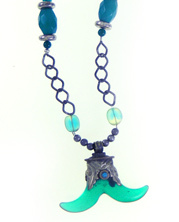 Artisan necklace with square glass green beads, Tibetan charms and accents. 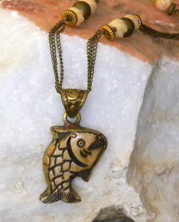 Earthy Tibetan fish pendant carved in Yak bone with accent chains and beads.